What is the price of Villas at MOKILA? Get at Pre Launch Booking Rate! Note: Above Villa Elevation is for reference only. 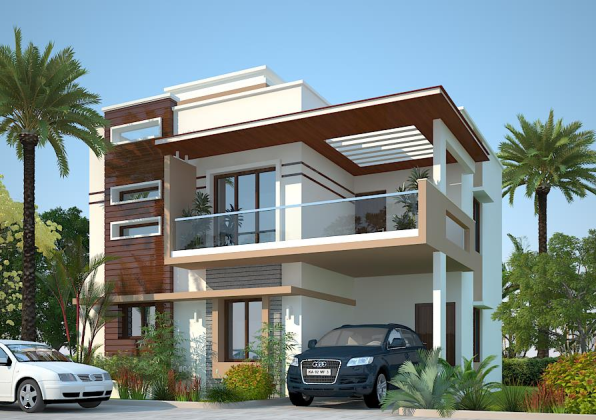 Why Book an Apartment when you can get a Villa at the MUCH LOWER cost of a 2400SFT flat? Project Pre Launch Booking is open. Only 10 Villas will be available at Special Pre-Launch Rate. The Project is HMDA Approved. Contact us and be the first to block plot when layout is released! What is the price of Villas at MOKILA? 75L, 100L, 120L, 150L?! If you WANT to own a luxury villa in Mokila, but the price being quoted in projects there is a dampner, cheer up! BOOK now at Pre Launch, at very special Rate! Club House with AC GYM, Indoor Games, Swimming pool, outdoor play areas, Superbly Landscaped Gardens, Tiled Walkways etc. 100% Vasthu Compliant & Secure with Single entry, Compound wall and Gate. R.C.C. framed structure with Earthquake resistant foundation. 4 � inch thick internal brick walls and 9 inch thick external walls. Quality brickwork in cement mortar. Internal Doors : M.T. Wood frame with Polished flush Shutters. Windows : Frames & shutters in M.T. Wood with glass panels & Provision for mosquito mesh, fitted with elegantly designed M.S painted grills and standard hardware. Grills : M.S. enamel painted, designed and fixed to the wall. Internal : Gypsum plaster finish, Two coats of Acrylic emulsion paints over a coat of primer. Bathrooms : Anti skid finish vitrified tiles. Covered Balconies : Clay or ceramic tiles. Utility : Anti skid ceramic tiles. Glazed ceramic tile dado up to 2� height above kitchen platform. Provision for modular kitchen Granite platform, with stainless steel sink / drain board & municipal water connection. Utility / Wash: Glazed Ceramic Tiles dado up to 3� height. Designer Vitrified Tile dado of Johnson / Bell or equivalent make up to 5' height. Granite counter top washbasin with hot and cold mixer valve. All C.P. Fittings of chrome plated of reputed make. Telecom: Cable points in all bedrooms, kitchen, Master toilet, living & dining areas. Cable TV : Cable connection in Living room. Water Supply: ISI Mark of GI / Kimplast / CPVC Piping. Drainage: ISI Mark of PVC SWR Sanitary Piping.